This is the conversation I had last week with a national automotive service chain. I got caught up in the moment, because an automobile mechanic I’m not. Yeah, back in the day I changed my flats and my own oil, but I’ve never, again I say NEVER, done a brake job. During this era of AAA and the miniscule savings gained from changing your own oil, when it comes to automobile maintenance and repair I hardly do anything myself other than pump my own gas & wash it. I call AAA and/or fork over the cash for someone else to handle it. So for me to personally change the brakes on one of my vehicles is waaaaay out of my comfort zone. Since there have been several technological automobile advances over the past few decades, i.e. rear view cameras, self parallel parking, air bags, etc. I was hoping this wasn’t the same tedious task I watched my uncle do about 40 years ago. Just maybe, after I removed the wheel there would be some type of touch screen hidden there with an app that I could run, or I could pull up the program source code to locate the runaway do-loop, or I could ping the network to see which host wasn’t responding. Unfortunately after I removed the wheel, I realized all of that was wishful thinking, no touch screen for me to play with. I decided I needed help, so I called my brother in-law and my friend both of which live about 1000+ miles from me. 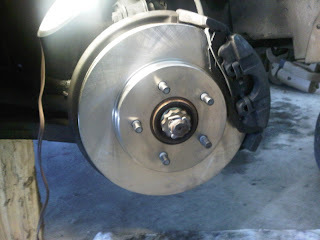 Yeah, yeah, I needed assistance from two people, again, I have NEVER done a brake job before. Plus I could spread out my gazillion questions between them to keep from looking like a total klutz. In addition to my phone assistance, I watched several how-to video’s on YouTube which actually was a very good idea. Needless to say, after 3 days of several trips back and forth to the automotive store, several phone calls and text messages to my instructors, I finally completed the brake job with new pads, rotors, and calipers all for about $200, take that! This was my first, and my last, brake job. Until this can be done with a touch screen, I’m out of the automotive repair/maintenance business. Heck, I may stop pumping my own gas. Maybe not, some gas stations do have touch screens now.